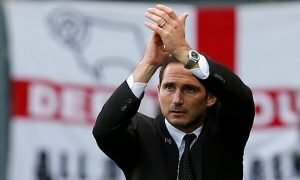 Lampard set for Ranieri reunion? | The Transfer Tavern | Where football transfer rumours fly or die! Lampard set for Ranieri reunion? Frank Lampard’s future has often been discussed here at the Football Transfer Tavern, and Neil Ashton of the Daily Mail has had his say on the matter over a pint and a packet of crisps. Ashton reckons Claudio Ranieri – the man who bought Lampard to Stamford Bridge all those years ago – is ready to sign the midfielder for a second time, this time for Ligue 2 side Monaco. Monaco are prepared to make an official approach for the 34-year-old, should Chelsea signal they are prepared to let him go as is expected. Lampard and Ashley Cole have both been told that their contracts will not be renewed, and are both free to start looking for other clubs. Lampard will leave a Chelsea legend, having played for the club for twelve years winning three Premier League titles and the Champions League in the process. What do you think Chelsea fans? Can you see Lampard moving to France? Vote in our polls below.